At Budget Blinds of Westfield, we're your local neighborhood experts that truly understand your needs. We're in your neighborhood, we know the local Westfield weather and community, and we’re backed by the #1 provider of blinds, shades, and drapes in North America. Over 25 years of customer satisfaction gives you peace of mind that only comes with choosing the proven leader. We bring the showroom to you in Westfield. We expertly measure your space, install beautiful window treatments, and back it up with the best warranty in the business so you can sit back and relax in the beautiful, Westfield weather and sunshine. We serve to give you the best in window treatments, so you can rest easy knowing your space will be beautified and optimized with window treatments that fit your individual needs. If you’ve been thinking about transforming your home’s interior into something truly special, Budget Blinds of Westfield is here to help. Our expert design team, paired with an array of stunning blinds, shades, shutters, drapery, and more creates the ideal home interior that complements any room, or an entire home. From the latest styles and innovative fabrics, to a host of on-trend colors, we’ll show you how fun and affordable it can be to upgrade your décor with the power of the #1 provider of custom window coverings in North America. Our consultative process is designed around caring about you and your home. We make the entire experience easy and convenient as we bring the showroom to you with our FREE in-home design consultation. From those unique shaped windows to energy efficient treatments, and more, Budget Blinds does it all for you, with style and service for any budget! We're local and here to stay to ensure you have peace of mind. As the owner of Two Maids & A Mop of Westfield, our staff of Professional House Cleaners wanted to say thank you to David for his education clinic this morning. We are grateful for you sharing with us your expertise on how to properly and safely clean window treatments. When ever we have a need for window treatments, we all know to contact David and his team at Budget Blinds of Westfield! Had our consultation this week. The owner, Dave Powell, was right on time, wore booties in our house (serious respect) introduced his process, mission. We then walked through the entire house as he asked questions about our intentions, style preferences, mentioning different products that might work. Then came samples and a world of possibility! Ultimately Dave was honest with us about what would work and probably wouldn't and took our budget into consideration throughout! 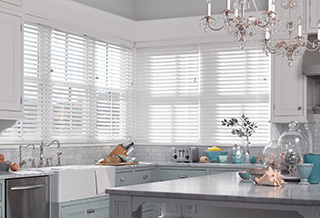 Budget Blinds has an amazing selection of blinds and shutters - and we are so excited about the style and finesse that our window coverings are going bring into our home! Blind installation in 2.5 weeks! Cannot wait! Had our home installed today. Thrilled would be an understatement. Not one mark on the walls, no dust, nothing. You couldn’t even tell people were working in my home today. The quality is great. I am so happy with everything. The process was painless. The owner came to our house and was very thorough and the finished product is perfect. GREAT JOB.